Like The Wife, with younger stars, more costumes and Paris. 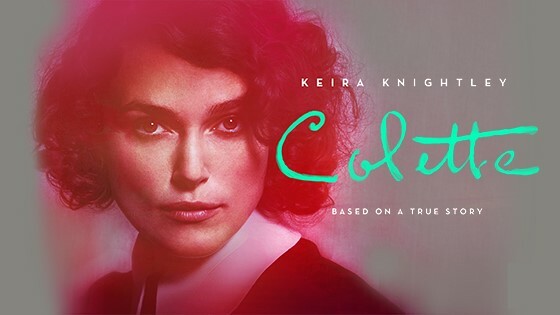 After marrying a successful Parisian writer, Willy, naive Sidonie-Gabrielle Colette is transplanted from her childhood home in rural France to the intellectual and artistic splendor of Paris. In need of a new novel but unwilling to do the work himself, Willy convinces Colette to ghostwrite for him. She obliges him with a semi-autobiographical novel about a witty and brazen country girl named Claudine. The novel becomes a bestseller and a cultural sensation, and its success makes Colette and Willy the talk of Paris. The confidence Colette gains from this is freeing, the credit and money Willy refuses to share with her excruciating. Nonetheless, she continues to play the part of the submissive and supportive wife. As Colette's accomplishments grow in both personal and professional spheres, she realizes that she has outgrown her husband. Determined to control her own life, she is stopped short by Willy's actions. Now, her fight isn't just about creative ownership, it's about gender norms, societal constraints, and revolutionizing literature, fashion and sexual expression. Keira Knightley and Dominic West the performances of their careers, and the Oscar bait season is open.